First, what is a Roth account? A Roth IRA or Roth 401K allows people to contribute after-tax money into an account, and any investment returns are tax free. Any contributions you make can be withdrawn at any time. However, you have to wait until you’re 59.5 years old to withdraw the returns or you’ll have to pay tax on the investment returns along with a 10% penalty. Compare that to a traditional retirement account. A traditional 401K or IRA allows people to make contributions pre-tax, which lowers your taxable income. When you withdraw the money, you pay tax on it – both the contributions and the investment returns. Excluding a couple different options, you have to wait until you’re 59.5 years old to withdraw money or you have to pay a 10% penalty. The ability to withdraw contributions at any point may lure people towards a Roth, but the reason that you get to withdraw your contributions is because you’ve already paid taxes on them! How do your pre-retirement and post-retirement tax rates compare? Consider a married couple who had a taxable income of $175K (yes that is a lot more than I make too) and maximized their Roth 401K’s, but not their traditional 401K’s. They retired at age 60, and are now in retirement with an exorbitant after-tax income of $100K per year. With their pre-retirement income, they would have paid 28% tax on most of their Roth contributions. However, during retirement, they should be in a lower tax bracket. With the Roth withdrawals, they won’t have to pay any income tax, but they’ve already paid 28%. With traditional accounts, they wouldn’t be paying a rate any higher than 25% and they could have reduced their tax liability when they were in the 28% bracket! By using a traditional account during their retirement, the largest portion of their income would be taxed at 15%, and smaller portions taxed at 10% and 25%. This leads to an effective tax percentage rate in the low 20’s – much less than 28%! So I ask the question – why did they make retirement contributions to a Roth and pay 28% tax on their investment, when they could have paid less than 25% tax by contributing to a traditional account? Maybe because they got bad advice or maybe because they just blindly contributed to a Roth. This is just one example, but it shows that making Roth contributions doesn’t make a lot of sense in some situations – if you haven’t maximized your traditional 401K and/or will be in a lower tax bracket in retirement. What about for early retirement? If you’re planning to retire early, there is a decent chance you won’t have a taxable income in the 25% tax bracket or higher after you retire. That said, your plan or situation may vary. If they had contributed to a traditional account instead, they would pay 10% or 15% tax on portions of their retirement income. This should lead to an effective rate somewhere below 14%. Add on the extra 10% penalty for early withdrawals from a traditional account and the effective rate should still be less than 25%. 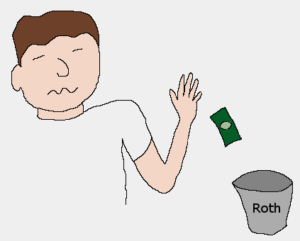 Even after paying an early withdrawal penalty, you could still end up with more money than if you contribute to a Roth! It isn’t good to pay penalties, so now may be a good point to mention that there are ways to retire early and avoid the 10% early withdraw fee on traditional accounts – even more of an advantage to traditional accounts! I won’t go into details in this post, but you can follow the links to two options for doing this: substantially equal periodic payments (SEPP) and a Roth conversion ladder. With all that said, Roth accounts can make sense! Despite my warnings about using a Roth, I use one. For various reasons, it may make sense for you to as well. First, you may want to contribute to a Roth if you’ve already maxed out your 401K. If you can’t contribute any more to a 401K and want to save more, a Roth IRA will provide you with better tax benefits than a traditional taxable account. Another situation where you may want to contribute to a Roth is if you plan to be in a higher income tax bracket after you retire. This can be the case for young people who will likely see their income increase. However, most people probably shouldn’t plan to be in a higher tax bracket when they retire. One last situation to mention is when you plan to use the Roth conversion ladder for early retirement. There is a five year waiting period from the conversion point until you can access it without a fee. During these first five years, you’ll need some income and previous contributions to a Roth may be able to provide this income. These don’t encompass every situation, but rather give an idea to just a few of them. Your situation and plans require individual consideration, and maximizing tax benefits can be complex. Put some research into your own situation or work with a financial advisor to make a plan – planning is important. Every bit more you are required to pay in tax, means you’ll have to save longer or spend less money in retirement! That’s why it is important to consider tax implications of how you’re saving for retirement! Don’t just blindly make contributions because you could be hurting yourself! Please note that these are my own opinions and I am not a professional tax or financial advisor. Your situation is unique, so if you are looking for professional advice, contact a professional financial advisor!